So what's the board consensus on this particular piece? Here is the original. Here is the fake fake fake. edit: If your post that I quoted was referring to a different (fake) piece; then mea culpa. Allegedly a different seller, but wow that description is similar. Condolences to whoever bought this. jamart44 (17) ships from Etobicoke, Ontario, Canada and has been an eBay member since Aug 30, 2014.
rah-4224 (25) ships from Hamilton, Ontario, Canada and has been an eBay member since Feb 26, 2014. 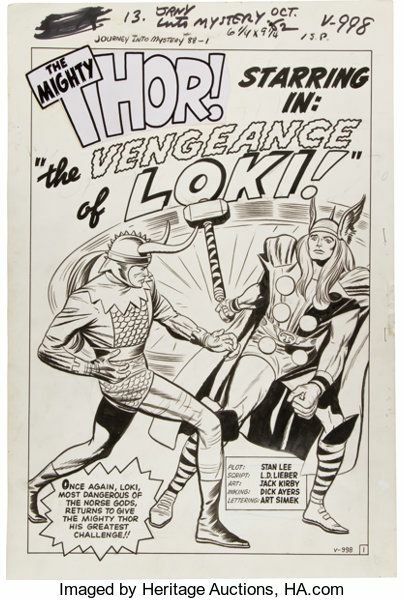 Both sell fake pieces with the same stamp on the back: "Publication prohibited without express permission of Jack Kirby". Both sell items from their father's personal collection. Their descriptions are more than similar; they are identical. Both use identical font and text colors in their descriptions. Identical. They even misspell QUESTIOS the same. The wording about their "father" is exactly the same. Condition: perfect some yellowish marks on the paper but drawing is in perfect condition. From My father’s personal collection, I don’t have any paperwork attached to this drawing so I present this work “ IN THE MANNER OF THE ARTIST & AS IS” so bid accordingly,but i will take it back for full refund if you are not satisfied so bid with full confidence. I hadn't noticed till just now how weird it is that he drew some of the blurb box borders too -- look at their feet. Well, let's see. The seller has sold a bunch of fake Kirby from different accounts. The Hulk was copied from a known source. What's the ambiguity here? Ahhh. The Hulk piece. I would say the same person who drew the Thor/Loki piece likely drew the Hulk piece. Unfortunately, his name isn't Jack Kirby. His name is fake, fake, fake. There's something about the lettering and the line work that makes me suspect this was drawn by the same hand as the above forgeries. This one is also for auction from Canada. If you like this one, I encourage you to also check out the Calvin and Hobbes -- not to mention the Picasso -- drawings in the same auction. ..., I encourage you to also check out the Calvin and Hobbes -- not to mention the Picasso -- drawings in the same auction. An embarrassment of riches. Surely. Is Taurus Auctions different than Live Auctioneers? That's what comes up if you go to Taurus Auctions. LiveAuctioneers.com is just a hosting site, like eBay, except their customers are local/regional auctioneers that don't already have an online bidding system in place. Same with Invaluable.com. Bidders don't see any direct fees for any of this convenience, aside from a (typically) stepped up buyer's premium. Everything aspect is less if you go traditional: bid/win in-person, pay cash, and leave with your lot in-hand. The converse is everything is more expensive if you do any of that the remote 'online' way or pay with a credit card; for the most part these houses are still not very 'online' friendly. Thanks, Is there much of a percent/price difference if you know? Varies auctioneer to auctioneer, but typically it's 3-5% more (than live in-person) to cover whatever noise LiveAuctioneers charges them to be on the platform and credit card fees. It's not onerous, and certainly is worth it for that special item that's only available in some remote location. Third-party shipping in a whole different matter. Most regionals are not set up to handle shipping, they only do cash 'n carry, so you have to find a UPS store or freight company in the area to handle the retrieval, packing, shipping end of it. That tends to start at $75 and go only higher. It's a credit to Taurus that they do directly ship. A few houses do, most do not. Most are strictly churn and burn operations. Anyway, my experience is more related to picking fine art out of estates. These can be large, heavy, framed, etc, where only really sweet hammers make sense because there is probably another $150 or more to be added in past that. I've often won pictures that would retail for $1,500 for $100 hammer but total $350 when the dust settled. If a sale is loaded with good pieces, I will take down many too knowing that my 2nd and 3rd pieces will ship nearly free because the big hit is the setting up the retrieval and delivery for the first piece. Anybody that's read this far and is intrigued, I suggest checking your local paper for estate sales in the spring (there are always tons after the snow melts!) and giving up a few hours on a Saturday to sit through one or two. It's pretty interesting (for newbs) and a learning experience, lots of odd characters populating these sales too. For folks on the mid/lower East Coast that enjoy looking at art (but not just comic art), I recommend either Material Culture or Slotin Folk Art. Anybody﻿ that's read this far and is intrigued, I suggest checking your local paper for estate sales in the spring (there are always tons after the snow melts!) and giving up a few hours on a Saturday to sit through one or two. It's pretty interesting (for newbs) and a learning experience, lots of odd characters populating these sales too. For folks on the mid/lower East Coast that enjoy looking at art (but not just comic art), I recommend either Material Culture or Slotin Folk Art. I do like them, and you are absolutely correct. Apart from “hanging” art, there are surprisingly good finds in jewelry, not the really rare stuff, but good Art Deco and Bakelite, along with mid-century and old pieces. The ones with gold or gems are sometimes valued at scrap, and the workmanship is ignored. But be careful, there is also a lot for garbage there, too. I'm not going to bring every single one of thse up anymore. 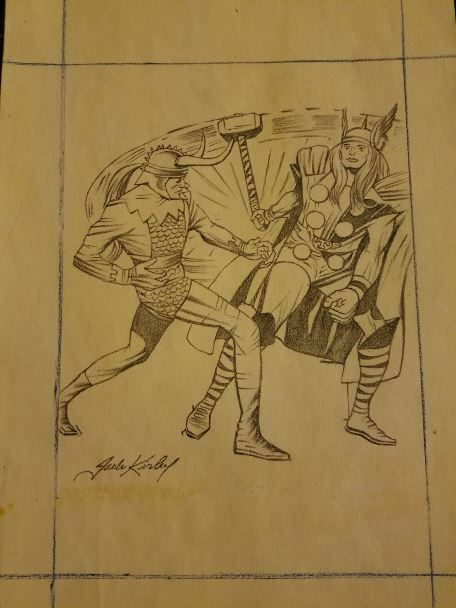 Here's a rule: if it's a Kirby sketch on eBay, assume it's fake unless you can prove beyond a reasonable doubt otherwise. Oddly enough, the seller lives in my town. I’ve just sent a note detailing why the Thor and Captain America are fakes. I suspect I’ll get spit upon. It seems that Kirby had an intern in the late 60s/early 70s named Rob, who now lives here in Saugerties. Rob gave these drawings to a friend here who recently passed away. The friends girlfriend is selling these drawings to help pay off debt for the passed boyfriend. She is taking the art down. I asked for Rob’s last name. Thanks for contacting the seller, Mitch.